Check out myFOXaustin.com's wedding segment below featuring Austin's very own Reverend Vikki. A tech savvy wedding officiant, Reverend Vikki uses technology and social media to help make her couples big day even more special. One more reason why she is truly Austin's Awesome Wedding Officiant! The wedding industry is a $70 billion dollar a year business. In this day of Facebook, iPhones and Skype, technology is being incorporated into every step of the wedding planning process even on the big day itself. As couples prepare to say their I dos, it’s only a matter of time before their marital status is posted on their iPad. “I'm sure I'll probably be posting on my wedding day,” said bride-to-be Jessica Baker. In a YouTube video posted by the bride’s videographer, the bride pulls out her cell phone and texting during the ceremony. That may be an example of technology gone too far, but for Chris Gomez and Katrina Kuzmich, technology helped define their big day. “I kind of live and die by social media,” said Gomez. At their April wedding, the couple incorporated technology and social media into both the ceremony and reception, from reading their vows off iPhones to using different iPhone apps as their table numbers. “I found out she was going to read her vows from the iPhone and I didn't want to be one-upped so I said I'll read mine from the iPhone,” said Gomez. The couple even encouraged guests to tweet using the same hashtag. “Throughout the event itself I think we were posting updates. I used the hash tag of #epicwedding so everyone was using the same hash tag referring to our wedding,” said Gomez. Mobile media is being used to say I do and to pop the question. Soon-to-be married Matt Greenwell proposed to his fiancé using an iPhone app he created that included a countdown to the couple’s anniversary. “It sent a local notification saying, open me and she did it opened up to say, will you marry me?” said Greenwell. While theses ideas may deviate from tradition, technology can make weddings unique and in many cases easier. “It's a way to cut down on cost, to really include everybody,” said Gomez. Tech savvy wedding officiate, Reverend Vikki Tippins, uses social media to get business, and has a QR code on her web site that gives visitors more information about her services. She also encourages her clients to use the web for everything from planning to invitations. One couple she worked with even used Skype for guests to attend the wedding via the internet. “What we were able to do was set up a lap top in the front row and make it so their parents, who were, I believe in Europe, were able to see them get married,” said Tippins. Streaming your wedding online is the way to include everyone, even those that can not make it on the big day. Stacy Yomaoka and Chris Anderson started up Marry Me Live in 2009. They work with videographers around the country to live stream wedding ceremonies on their site. It’s that idea that the internet can help connect couples to just about anyone and any wedding resource that was the basis for Weddingwire.com. “We see ourselves as a technology company trying to simplify the wedding process,” said Weddingwire.com Chief Marketing Officer Sonny Gaguly. In a Skype interview with Gaguly, he says 96 percent of brides are planning their wedding online. Bride-to-be Jessica Baker is preparing for her walk down the aisle by using the internet for just about everything. “I don’t think I would have been able to make the decisions, I would have gone store to store searching for dresses, not knowing what I wanted in my head before I got there,” said Baker. Today, couples can use mobile media apps to plan and keep in touch with vendors, register completely online, email invitations and even post videos on Facebook inviting people to the wedding. Using social and mobile media may stray from tradition, but as technology develops, incorporating it into the big day maybe the new matrimonial norm. “I think as long as you embrace technology, don't be afraid of it, get to know it and use it as a tool, but don't let it ever keep you from the things that make life worth living, then it will all be great,” said said Tippins. According to Brides Magazine and David’s Bridal surveys, one in five brides use mobile media apps to plan, shop and register. Also one in five brides use Evite or email to invite guests or send out save-the-dates and nearly half update Facebook status within one day. 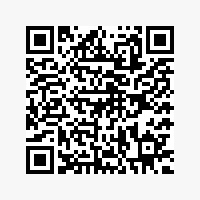 Scan Our QR Code or visit our Wedding Wire site!